The TactaPad is just a concept model, not in production, and I’m not even sure the movies are real, but it’s an interesting idea nonetheless. (Thanks to Chris O’Shea for the tip!) 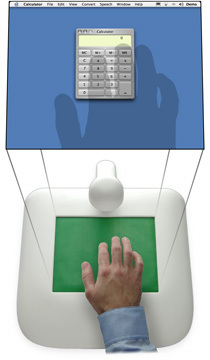 The idea is, you touch a tactile surface with your hands, and a camera maps an image of your hands onto the screen for additional visual feedback. The hardware would be compatible with existing Mac applications (see a demo video of GarageBand), though you’d of course need custom software for multi-touch capabilities. I think it’s clear that this is the direction interfaces will ultimately go. Mice work, yes, but they require lots of traveling with your hand to get from one point to another. Musicians love the Windows tablet PCs. Think about it: instead of having to do all that mouse traveling in Reason, for instance, just tap what you need. The even bigger problem is the inability of a mouse to manipulate more than one parameter at a time. This will require not only new hardware, but new interface designs. The remaining obstacle is cost: the TactaPad creators anticipate a price around US$1000. Of course, if you want these capabilities now and have US$2500 free, go with the Lemur interface, which has built-in multi-touch and the ability to create custom multi-touch interfaces for music software. Ableton on Apple-Intel: ‘Bout Friggin’ Time!